The Review on Antimicrobial Resistance has released a series of recommendations that urge farmers to cut down on the amount of antibiotics they feed their animals. Firm, acceptable targets and restrictions for antibiotic use are necessary to prevent the emergence of a “post-antibiotic era”. Humans generally take antibiotics in response to existing infections or as short-term preventative measures against specific risk factors, like open wounds or abscesses. Farmers employ antibiotics more routinely in their animals for prevention or to increase weight gain, although the latter use is banned in some nations. Intensive farming conditions where cramped, dirty conditions hasten the spread of bacteria also see more regular use of antibiotics. Resistant bacteria can travel from livestock to farmers. Resistant bacteria can pass on to consumers through meat. Resistant bacteria (and more antibiotics) are released into the environment through waste disposal. 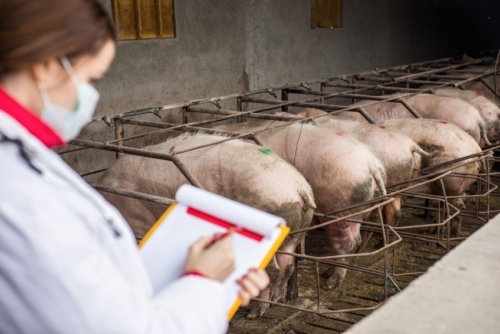 Earlier this year, pigs harboring bacteria resistant to colistin—widely considered to be the antibiotic of last resort—were discovered by doctors in China. Antibiotic-resistant bacteria typically appear in livestock before being found in humans. The review calls on firm standards and targets for acceptable antibiotic use in farms. The use of 50 milligrams (mg) of antibiotics for every kilogram (kg) of livestock is seen as an acceptable target. The U.S. uses roughly 200mg/kg, Cyprus employs 400mg/kg, and Denmark uses 50mg/kg. The Danes are used as an example of how these lower levels of antibiotic use can be achieved while still maintaining market prices. More hygienic living conditions for animals, better vaccine development, and improved diagnostic testing are pointed to as methods that can prevent disease without risking antibiotic resistance. Additionally, the review urges that countries need to agree on a list of antibiotics that should be banned in animals due to their central importance for human health. Presumably, colistin would be among the drugs on this list. This last call of action is not new. There have been urgings to restrict human antibiotic use in animals since at least 1969, but the most recent call came in a journal essay published in October of this year. Time will tell whether the advice is heeded or not. Gallagher, J., “Antibiotic Resistance: World on Cusp of ‘post-antibiotic Era,'” BBC News web site, November 19, 2015; http://www.bbc.com/news/health-34857015. Gallagher, J., “Farmers Urged to Cut Antibiotic Use,” BBC News web site, December 8, 2015; http://www.bbc.com/news/health-35030262. Meek, R., et al., “Nonmedical Uses of Antibiotics: Time to Restrict Their Use?” PLoS Biology, 2015; doi:10.1371/journal.pbio.1002266. O’Neill, J., “Antimicrobials in Agriculture and the Environment: Reducing Unnecessary Use and Waste,” Review on Antimicrobial Resistance web site; http://amr-review.org/sites/default/files/Antimicrobials in agriculture and the environment – Reducing unnecessary use and waste.pdf. , last accessed December 8, 2015.